Making All Stops by O.S. 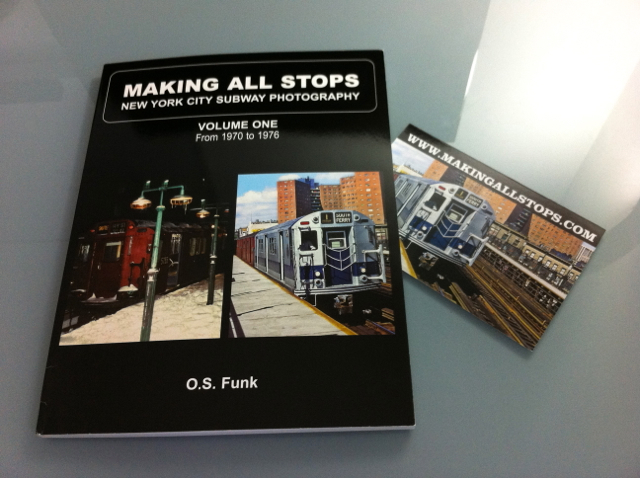 Funk has got to be one of the greatest high quality NYC Subway Photo books I’ve seen and with that said, this book not only offers photos but also offers tributes to the transit workers of the age, and their love for photography. Taking passions from both their work and their hobby, they have generously contributed their works to make this book possible. Here is my review of Volume One, mainly featuring photos from 1970 to 1976. The book begins with an introduction and a dedication to Steve Zabel, Zabel being a transit employee for over 20 years, and combining his passion for photography, to go the extra mile in photographing the NYC Subway. The book is meant to have something for everyone, and the ones born during this time will most certainly be able to relive the memories of a vastly different system than what we have today. For the ones that haven’t it is an interesting trip into the history of the NYC Subway, and one that can be felt through vivid photos, and commentary provided by the several photographers contributing to the book. The next part of the book is an interesting fact chart of movies that feature the NYC Subway, all the way from the 1970’s to the 1980’s. These classic movies are all given a brief comment on what they feature, and a rating presumably depicting how well they showcase the NYC Subway. If you want to check out some movies showcasing the NYC Subway in this time period, this list is a great one to have. We almost begin the meat and flesh of the book, but before we reach that we have a short timeline from 1970 to 1989 documenting all the major events in NYC history. At last we get a look at Steve Zabel, flipping through his photos he’s been everywhere from Pittsburg to the SEPTA system. Steve Zabel was called a risk-taker in the book, and that clearly shows in his rooftop photos. The book features 20 photos from Coney Island, all the way to the Bronx. All are breathtaking views, very rarely seen by the average person. This section features cars with odd numbers. The book calls them special numbers, but other than the cars having unusual or funny numbers, I felt there weren't really anything special about them. The photos here mainly show these oddly numbered cars like 7777 or 6200. 6200 has 2 photos showing how it transformed from new to vandalized. At this point, we begin the tour from the 1970 to 1976. Photos showing shiny new railcars roll along the rails, and within just a few years, graffiti goes to become a signature of the NYC Subway. Still, our fearless photographers still manage to find a shiny new one, and at the best of places too, with a set of silver and blue on the 4 with the old Yankee’s Stadium open in the background. Through all this we also get a glimpse of the 3rd Avenue Elevated, itself with its own set of 20 photos. To be honest, I’ve only really read books from the library containing photos of the NYC Subway. The difference however is massive, as the photos here were clearly selected to tell a story. The story begins with an era and end with an era. And the ones who tell us the story is this set of passionate photographers who were there to take it all for us to see and share today. Some notable photos, that I personally liked, no doubt all of them were great, but just some that caught my eye. IRT Gun Hill Road, Station mezzanine/interior entrance. Great photo, didn’t find it anywhere online. Super white, super spotless car #7777 at 174th St. in the Bronx. R7 car #1477 as the KK train, at 57th St. on 6th Ave., that station is still brand spanking new in this photo. There are certainly a lot more photos, I wanted to share, but alas you’ll have to check out the book yourself in order to fully appreciate the era. I cannot post any photos of the inside of the book here, as I have to respect the publishers decisions. Visiting nycsubway.org will not curate fantastic photos for you, and the book contains plenty of photos that aren’t online. If you are a true railbuff, this collection of photos is a must have, and I cant wait to see Volume 2. If you are a general railfan with even a slight interest, this book is worth a look, as it provides a good way to get a glimpse of the 1970's era NYC Subway system. That movie list will certainly help with that as well. If you guys have any questions, please feel free to ask me in the forum. Note: This is a sponsored post brought over from the old BVEStation for archival purposes.